The falketind down750 hood Jacket is a warm and versatile hooded down jacket made for all season use. 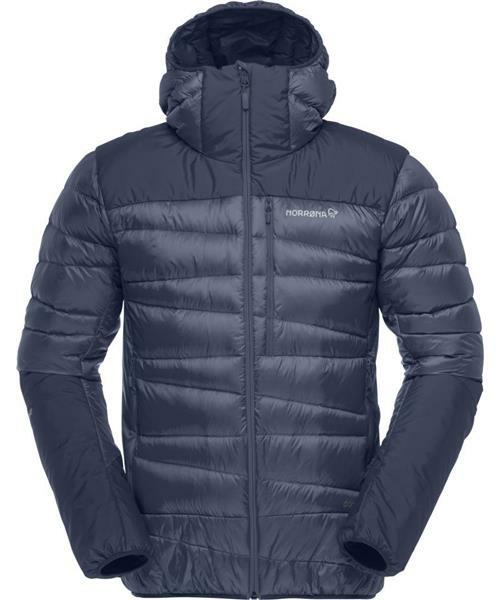 The jacket is light weight and can be compressed into its own pocket which makes it a perfect bring- along insulating piece. This jacket works perfectly as an outer layer on cold summer days as well as mid layer during the winter. To prevent moisture, the sides, neck, lower arms and bottom back is made of synthetical insulating fabric. The down is distributed in a T-shirt shape to ensure great warming properties where it is most needed. The shoulder piece is made of a combination of down and synthetical material to ensure durability in this exposed area. Other features include hand warming pockets, chest pocket and elastic cuffs.